It's time to roll out the red carpet, as Animefringe examines anime's track record at the Academy Awards. If 2005 could be summed up in relation to the anime released this year, it would have to be known as 'The Year of the Blockbuster.' Studio Ghibli and director Hayao Miyazaki, two names that set the standard for animation and story telling, released Howl's Moving Castle in North America. 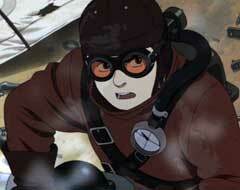 With Steamboy, Katushiro Otomo returned to the big screen as a director for the first time since Akira. Ghost in the Shell: Innocence, the sequel to one of the most famous anime movies of all time, was released on DVD. Appleseed, a movie adaptation of Ghost in the Shell manga-ka Masamune Shirow's manga of the same title, was given limited theatrical release earlier this year. That is only counting films that have been released in America; in Japan, there has been the Full Metal Alchemist movie and the much anticipated Final Fantasy VII: Advent Children film. However, only films that have been played in theaters in the US for a certain length of time are eligible for an Oscar. Out of the many big anime productions this year, only two, Howl's Moving Castle and Steamboy, are eligible to be nominated for the 78th Academy Awards. The category for best animated feature film is still relatively new to the Academy Awards, having been introduced for the first time in 2001. Before that, the few times that animated films were nominated for Oscars were usually in categories such as 'Best Song.' Disney's Beauty and the Beast is to this date the only animated movie to have been nominated in the Best Picture category. Spirited Away won the Oscar in 2002 for Best Animated Feature Film. Since then, no other anime has won or has been nominated for the award. Could either of this year's eligible movies break that streak? Howl's Moving Castle comes from the same studio and director as Spirited Away. Both have magic, a curse, and beautiful animation. Beyond that, the two have very little in common. While Spirited Away was a tale about a girl learning to take on adult responsibilities, Sophie needs to learn to not take things so seriously. She starts to loosen up when a witch puts a curse on her, turning her into a ninety year old lady. Leaving her old life as a hatter behind, she comes to live with the wizard Howl, his fire demon Calcifer, and young apprentice Markel. Outside of Howl's castle, the country is in the midst of a war. Eventually, the fighting starts to threaten Sophie's new home. Sophie and Howl must find a way not only to lift their respective curses, but also to bring peace between the two warring countries. 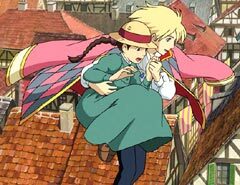 Howl's Moving Castle has all the ingredients of a Studio Ghibli movie: a strong heroine, wonderful supporting characters and amazing visuals. Although it is a fine Ghibli movie, it did not seem to gather the same critical acclaim that Spirited Away did while in its theatrical run. 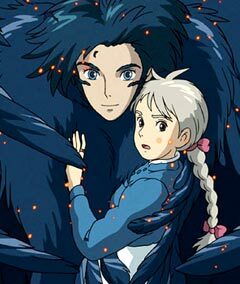 For whatever reason, Howl's Moving Castle doesn't have the same 'man-on-the-street' level of recognition of Princess Mononoke and Spirited Away. This may be because, while Howl's Moving Castle was only released this summer, the other two movies have been out for several years now, giving them time to settle into the mainstream consciousness. Howl's Moving Castle will probably gain popularity when it gets released on DVD, giving those who missed its limited theatrical run a chance to see it. Unfortunately, by that time, the Oscar race will probably be over. Steamboy is more like the typical summer blockbuster movie than Howl's Moving Castle: it's jam-packed with action. Then again, what else would you expect from the director of Akira? Ray Steam is the latest in a line of inventors. He lives in the alternative-past of 1866 England, where steam is the main power source. His grandfather has mysteriously returned from an expedition in America where he and Ray's father invited a new kind of 'steam ball,' a small device that contains highly pressurized steam. Many people want the steam ball for themselves, such as the O’Hara Foundation arms dealers and inventor Robert Stephenson. Ray must keep the steam ball from falling into the hands of those who would use the advanced technology as a weapon. 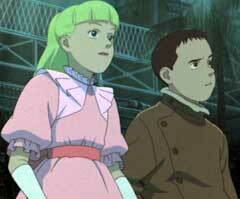 Steamboy isn't as nearly as dark as the apocalyptic Akira. It’s more like an exciting children's movie, with almost continual explosions and debates on the nature of science. Although it is not as ground-breaking as Akira, Steamboy is a fun movie that, like Akira, gets crazier as it goes along. 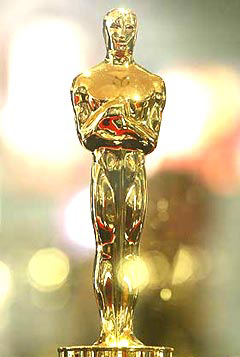 It's really up in the air what animated films will get nominated, let alone who will win the Oscar come March 5, 2006. It's an unpredictable category, in that it's open to any kind of animation, from anywhere in the world. So far, the category has been dominated by CGI movies from America, with the only exception being Spirited Away, a 2-D film from Japan. This year, CGI still makes up the majority of the eligible animated films, but there are also two stop-motion movies, as well as the two anime films featured in this article. Out of the eleven eligible, only three will be nominated on January 31. Out of those three, only one will bring home the golden man Oscar.